This is the new version of the color selector that will appear in the next release of Real HDR 1.2. The major change consists in a wider and more precise selection, a comparison between the actual color and the new color, the possibility to confirm or revert to the previous one and the possibility to choose the color in 8-bit range both for RGB and HSV. Keep in mind that being the SpriteLights rendered in 32-bit, there is no control over the light intensity in this panel, since it is reserved for colors only. In short: the brightest color that can be selected may not be brighter one available. 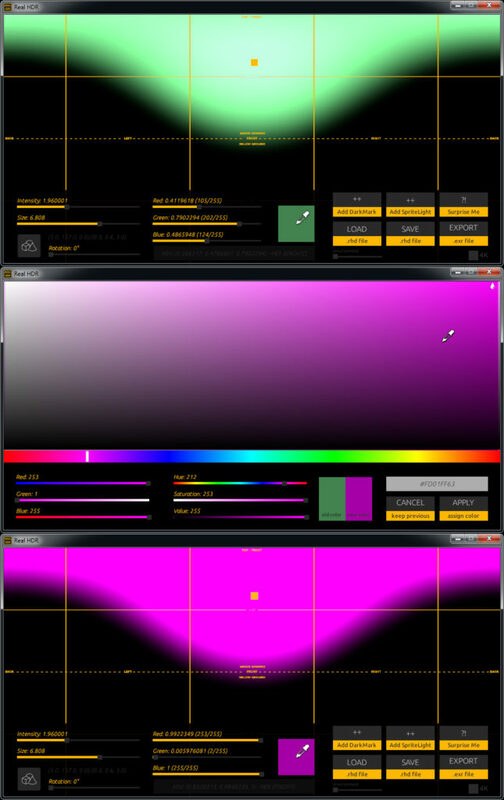 The color selector must be used together with the intensity slider.